In mid-October, 2008, The WHY? Files received a sighting report from Jason, a resident of Spennymoor (County Durham – UK) for most of his life. Jason is in his late 30’s, has lived with his girlfriend for six years and by profession is an engineer. Jason’s experience was, with little doubt, very real and despite the lack of supporting evidence we feel that the report is of interest and value. Please forgive some of my weak attempts at humour, I guess I'm still trying to make light of this experience. It's played on my mind (even while asleep) for a week now and I feel I've got to get it off my chest to someone who won't think I'm insane. Last week’s strangeness was at exactly (I checked the time on my watch) 23.38 on Wednesday night (Wednesday October 8th, 2008). It had been drizzling on and off all day but was not drizzling when I was out. I couldn't see the moon; it was overcast mainly, with a few patches of night sky visible through the cloud although I could see any stars. I had my dog (a 7 year old Border collie) out late on what used to be an old railway line, it's now a nature type walk that if I wanted to, could follow the 8-9 miles to the next town (Bishop Auckland). Usually my dog Oscar trots off in front, sniffs about and waters lots of plants, but doesn't go too far off without waiting. Not that night though. He unusually just walked along with me, even after a few attempts to tell him to go off and do what dogs do. Up ahead in the trees I could see a strong white light. Strong enough for me to be able to see the trees either side of the path lit up and the path floor illuminated. At first I thought it was a car or something coming down the path, but then thought it couldn’t be as the local council has installed those gates every so often to stop hoodlums on motocross bikes killing people like me out walking the dog. All right then, someone with a very powerful torch or something. It just didn't enter my mind it would be anything weird. I carried on for another 60 metres or so, when the light started to move off to my right........and up. That stopped me in my tracks. Once it had sort of cleared the top of the trees, I could see it a bit more clearly. It was 100% a structured object, kinda disc shaped but not perfectly round, sort of elongated. I'd say "roughly" 50 feet long, 20 feet wide and 20 feet in height. It was bathed in a kind of white glow, but it wasn't like you could see its source. So hard to put into words. On the underside were two spots of blue light, one at each end of the longest length. Reason I say it was structured was I could clearly see its outline. It moved off to the right at a 90º angle to me, about 50 feet in the air, down into the large area of fields and stopped again. It just sat there 50 foot up in the air not making a bit of sound. Nothing, not a whisper the whole time. By this time, I'm not kidding and don't mind admitting, I'm seriously spooked. All sorts of things running through my mind. What the hell is it? Is it me? Am I seeing things? It couldn't be just me, the dog was looking directly at it, stood right next to me, I mean RIGHT next to me pressed against my left leg. It then moved off away down the field, hard to judge speed, but I'd say no more than 20 mph, and down to a line of trees (I used to get conkers in there when I was a nipper) where it stopped again, the blue lights underneath went out and then it shot off to my left at a 45º angle upwards and at a stupidly silly speed until it went from sight. So there you go, make of it what you will. Was I seeing things? ball lightning? a cloud? a silent helicopter? a plane?, swamp gas (like I live near a swamp) exploding cow flatulence? a light house? (30 miles from the coast), a floating street lamp? Elvis in his light buggy? I DO know a few things though. 6/ I DID see it. So did my dog.......and it wasn't in anyway "normal". I've spent pretty much 7 days on a wild internet jaunt looking at some strange things, but this site stood out as one of the best for not being sensational. I'm not aware of any geological faults, that is, I've never heard anything mentioned. 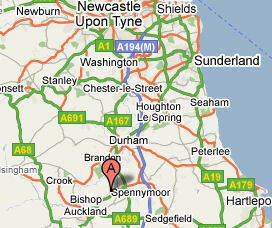 I've lived in Spennymoor for 32 years. Of course I could be wrong, it's just not something I've ever given any thought to. UFO's have been one of those topics that I've of course read about in the past. I've always been open minded on the subject to be honest. Are they from elsewhere in this galaxy? Another galaxy? I've no idea. I do believe we, as an intelligent species, would be incredibly small minded to think our planet has the only life in the universe. Whether another intelligent species exists and has advanced to the point of being able to transverse the vast distances involved in space travel? Again, I don't know, but I don't see it as being 100% impossible. Thanks for giving me a voice that won't immediately ridicule once I've told my story. Jason’s experience is, perhaps, typical of the many UFO sightings that are reported each year. As usual there is little or no evidence, as yet, to give support or substance to his report but there are few who would doubt his honesty.